Welcome to the great world of memes! Memes have become widely used and incredibly popular within the digital world in today’s society. They are mainly used to invoke humor and help people relate to one another. As far as my meme is concerned, I decided to take a jab at LeBron James, an NBA player on the Cleveland Cavaliers. Being from Boston and having a lifelong dedication to the Celtics, the Cavs and LeBron are both considered my ‘enemy.’ LeBron is known for his perpetual whining on the court relating to just about everything, garnering a well-deserved nickname of being a crybaby. Thus, this meme was born. With the NBA season just starting, I thought it’d be funny and timely to generate some content about him. Final Engagement Number: 516 views!! The following benchmarks were my original objectives from my marketing plan. After passing in my marketing plan, I realized that we were purely tracking Imgur views and not any other form of view (like, retweet, share, etc.). Those benchmarks were in my original marketing plan, but I will touch on those and my results briefly. Facebook: I garnered 22 likes on Facebook and 3 shares from the content I pushed via that platform. Instead of comments, I had a lot of people message me via text that they really liked my meme and were curious as to how I did it. So, even though the comments on Facebook weren’t there, there was still engagement. I’m sure that more Facebook comments and likes would’ve pushed the post up on people’s feeds so that more could’ve had the opportunity to view the meme, but I’d say Facebook was a good way to garner views, especially with my friends and family sharing it to their pages. Instagram: Originally, I thought we were tracking likes, but the only thing that actually mattered was Imgur views. Regardless, I posted a picture on my NHsmc account of my meme next to a Dunkin’ Donuts coffee cup and my Mac covered in stickers to give off the “Boston girl” vibe. I put the link to my meme in my Instagram bio, which can or cannot prove to be effective, it just depends. If likes did count however, I would’ve posted on my real account to maximize those likes. Not thinking that putting the meme link in my real account bio would be effective, I refrained from posting it on my real account at all. I figured Twitter and Facebook would be much more effective. Twitter: I posted on Twitter four times, and my first post garnered four likes. This is also the Webcard tweet that I used the $5 spend on. Between these two, I got 27 link clicks, 60 total engagements, and 474 impressions. I could have posted my meme more on Twitter to get more views, but didn’t want to overload the same content in terms of the actual meme itself. With another one of my tweets, I tried to relate more to people in an ‘everyday’ sense within the tweet content itself (“When Dunkies is out of butter pecan” with LeBron’s crying face at the forefront). My final tweet was more of a call to action to get people to engage in my link. Ten clicks to the meme Imgur page proved that it worked! I chose two relevant hashtags as well (#nba, #lebron) which helped. If used properly, hashtags bring in more people that otherwise would not have seen my meme, so I’m always for them! Below is my Twitter Webcard. Looking back on Twitter, I could’ve posted earlier in the day or later on at night when people were sitting down doing homework (and probably procrastinating) to get more engagement, so I can adjust that for next time. Not only that, but it’s always harder to get people to click on a link rather than just simply having them see the whole picture in a tweet, so maybe that’s why the link clicks weren’t as high as I thought they’d be. The meme text was hidden in all of the posts, so that could’ve also altered engagement because people were unsure of what it was (maybe thought it was just a picture). Overall, if some of my friends retweeted my meme, it could’ve garnered more views. Just having it on my profile is limiting. I also think that posting the same meme multiple times may make people uninterested or more willing to scroll by it because they may’ve already seen it before. The memes that go viral on Twitter are ones where there’s no link to it; the meme is fully all there within the tweet. Back to my earlier point, I may have received more likes and retweets if I just posted the full meme instead of the text completely hidden until someone clicked on the link, but the assignment noted to hide the text. Although I didn’t reach some of my objectives, I originally aimed and set the bar pretty high. Regardless, I’m glad that I reached 500 views and got a feel for designing a meme as well as curating a marketing plan. I also achieved all but one of my goals, so that’s great, too. I chose to spend $5 on one Twitter ad. I could have broken it up more to encompass putting $1 into five separate ads, and maybe that would’ve been more effective. 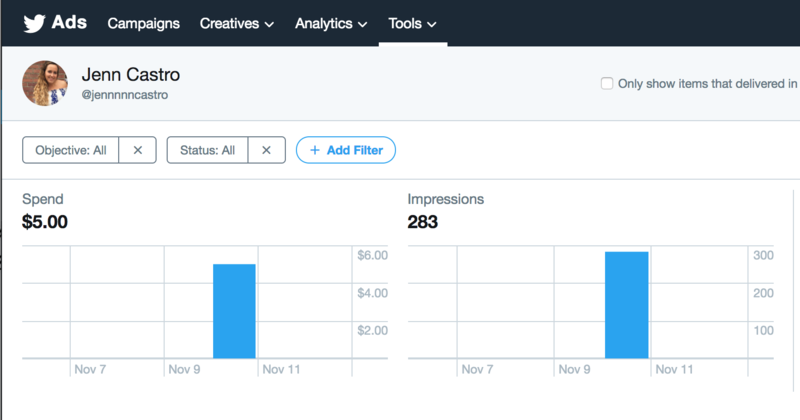 I ran it at 5pm on November 10th, as data I’d previously found on Followerwonk showed that my followers were most active around this time. Overall, I would’ve been more successful in terms of views if I created a meme that related to more people. With my meme, it was only about LeBron. I could’ve made it a more relatable event for people with the same picture, but different words (i.e. 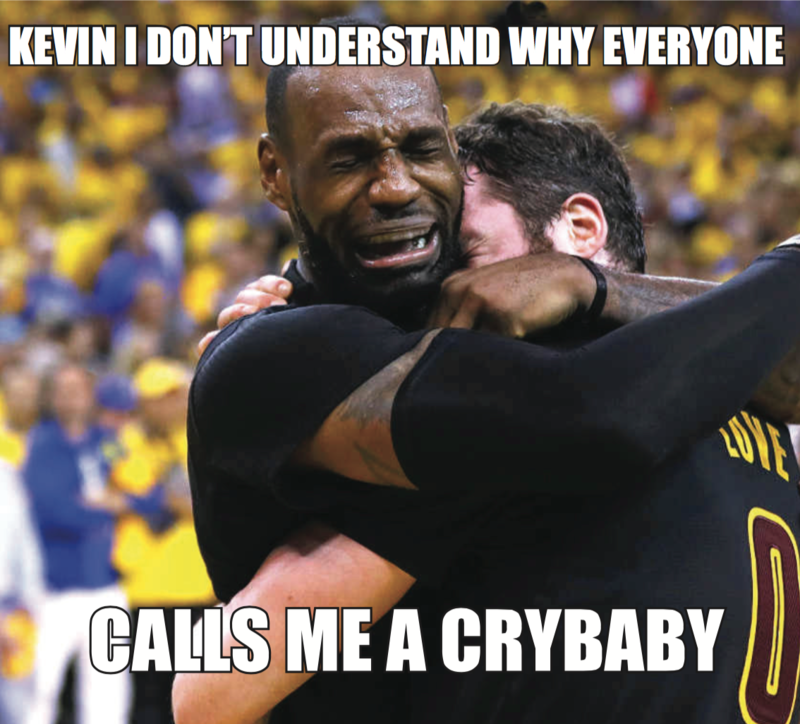 something that would make people feel the way the picture was describing but not directly relate the words to LeBron). Regardless, I had a lot of fun with this project and can’t wait to create more memes in the future!